Two-bedroom penthouse with an incredible view of Banderas Bay. The 'Girasol' condominium is located five miles south of downtown Puerto Vallarta. We are surrounded by a beautiful sandy beach which is great for laying in the sun, throwing Frisbees, or playing in the waves. The pool and our romantic restaurant both sit right on the ocean and also have a spectacular view of the bay. If you are looking for charm and beauty, you cannot beat this. There are two different balconies in our unit to sit and enjoy the ocean and the beaches as well as a wonderful view of the city. 2 incredible Canopy Tours are within 25 minutes of the condo.....and Mismaloya Bay (the most famous beach in Puerto Vallarta with spectacular snorkeling, parasailing, and jet boating) is less than three miles down the road. We love our time at the Girasol. We try something new every visit, from zip lining, to para sailing, to snorkeling, to deep sea fishing. There is something for everyone. We know you will love staying in our 'home away from home'. Give us a try! We chose this area/condo because my parents started coming down here many years before we purchased and loved it. Now all my family have units here. It's a great honeymoon, Christmas, spring, or fall get away for us. Having access to the fresh water pool, and twin beaches right outside our door is amazing. If you want to bring your gang down, let me know. We have access to renting units 301, 205, 211, and PH 14. The fresh water heated pool is great for year round swimming. The beaches are smooth to walk on, and beautiful to play in. The restaurant has wonderful, affordable food, and the mini super on the main floor is perfect for the items we might have forgotten, or just to have a treat, or extra snack for game nite or to add to our meals. The onsite laundry facility is perfect for mid week cleaning of linens or towels, and there is a work out room as well. A library is offered too, to trade books and read to your hearts content. The view from our balcony is priceless, as our the sunsets you'll see. There is easy access to the bus or a cab to get to anywhere you want to go. Los Arcos is close by, as is Mismaloya, or El Eden, or Chico's paradise, or town and the malecon and lots of shopping. Its really a paradise to visit PV and the Girasol. We just replaced them all so they are quiet and very cool and efficient. We have sheets and pillow cases for the beds, as well as bedspreads and blankets if you need them. We are part of the laundry club. It will be a free service to you if you sign up at the front desk for a 2 hour session. Laundry located on the 2nd floor. You take soap, etc & wash/dry your items. I purchased cable/wifi for PH 14. Password given before check in. Girasol provides access now by front desk, pool & in the library, too. Ask the front desk for the password & connection information. I have beach towels and towels for showering. I keep them stocked, but guests sometimes leave them, lose them, or take them home, so you might want to bring extra beach towels to have plenty. Brand new refrigerator, added 1/1/16! I have a small toaster oven. Just bought a new one March 2018. Just bought a new tv. Enjoy. We have the biggest package that IZZI provides. We tried to get the most english speaking channels we could. I have a cd player in the living room area. Please bring the dvd's you like to watch. The Girasol provides a library of many books that you can borrow to use for your stay. Then we ask that you return them as your stay concludes. There is a scrabble game, and yahtzee and playing cards. Located in the work out room. My condo has two balconies with chairs on the lower one to sit on to whale watch, or see the beautiful sunrise and sunsets. You can ask at the front desk where you can rent bikes in town. The golf course is in town and closer to the airport. You can take a cab there. This pool just had a new heater installed so it stays a wonderful temperature all year long. It for guests of the Girasol only so it's like a private pool. Grocery Store onsite, restaurant onsite, full maid cleaning and partial maid cleaning that you pay for are available mid stay if you desire. You can also save money and use the laundry area and wash your own. Call the front desk to sign up for a time. You provide your own detergent/cling free sheets, etc. Assisted calls thru the front desk are charged a minimal fee. You can just have them open up a line and you can place the call too. Had a great stay at this property. 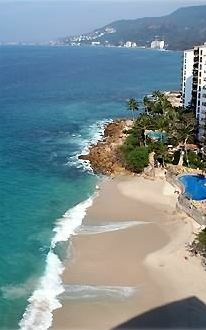 If you want the best beach, sounds, and views in PV, this is the best place to go. The view is wonderful. With Girasol Sur when you pick a reservation you have two choices, both marvelous. City lights or the southern coast. This offers some of each and a wonderful kitchen. Hotel staff very fluent in English and Restaurant on site, but run as independent business. Staff great, food quality varied as does online reviews. Catch city bus across street or Taxi. About $0.60 each for bus and 20 minutes. All bedrooms on second floor and definitely not accessible if handicapped. Spacious balconies on both floors. Outside living area and master bedroom. Owner great to work with. My family had a great time! Wendee was very helpful and easy to work with. Easy to get to downtown PV or Mismaloya from the bus stop out front of the building. Beautiful beach and having the restaurant right there was a nice bonus. We have a toddler so the steep stairs inside the unit was a bit of a challenge for us, but probably won't be a problem for most. Girasol Sur is our favorite vacation spot of all time. The beach is fabulous and we especially love the restaurant! This penthouse apartment has incredible views and is nicely appointed for a perfect stay. We especially liked all of the beach supplies available for use (chairs, toys, umbrellas and noodles). The air conditioning is great. We didn’t actually spend a lot of time inside! I recommend this property highly! We had a great time with our 3 kids who are 5, 5, and 6 years. Plenty of entertainment for them just with the beaches and pool in the property. The pool has a good amount of shallow depth so they were able to play without a lot of worry. We did rent a car which was great to have as we went into downtown PV most days. Parking was a nightmare (be warned). Did a day trip to the zoo and Mismaloya (zoo was a hit, beach we promptly turned around and went back to our beach after walking to Mismaloya). Thanks Wendee. Your condo was perfect for our family. Clean, well stocked, with great views from the dual balconies! Wendee’s penthouse was everything we hoped it would be. The view is fantastic; the sound of the waves soothes the soul. The two beaches, pool, restaurant and small market here at the Girasol provide everything you need for a relaxing stay, while the Romantic Zone and Malacon are a 10 minute cab ride or short bus ride away. The sunsets from the open restaurant, with the surf only feet away, make it a special place. Lastly, Wendee and the staff make this a thoroughly enjoyable and welcoming destination. We look forward to coming back. I request that my guests pay on vrbo with an e-check if possible. There are extra property fees when using a credit card, and none when paying by e-check.